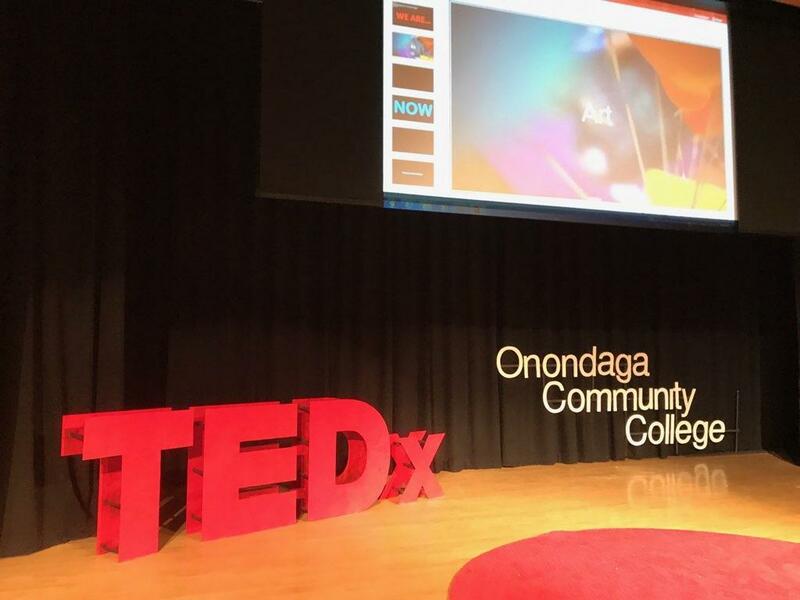 Among other speakers included were students, physicians, a librarian, musicians, and professors, many of whom were OCC students, faculty, and alumnus. All of them spoke about the event's theme "We are" which focused on collective humanity in terms of coming together as a community. 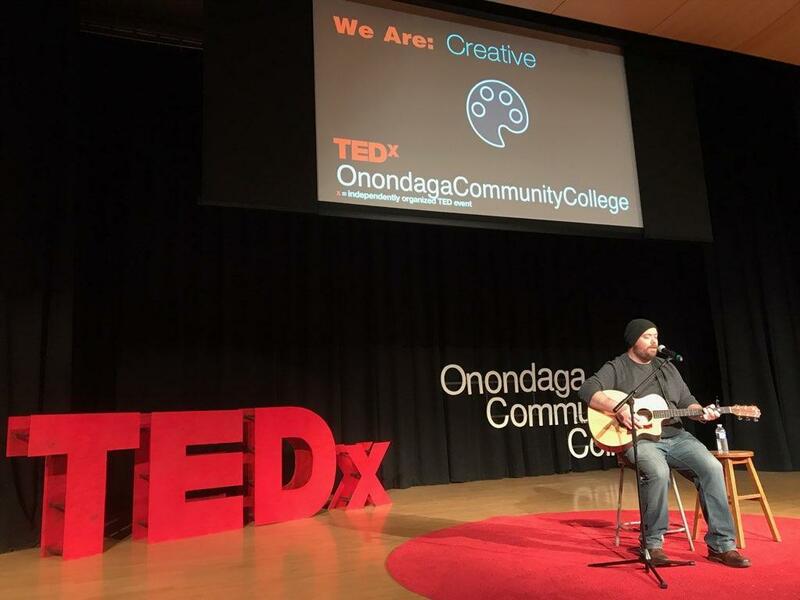 Singer and songwriter Connor Campbell who recently joined the Central New York music scene took the stage to perform two of his original songs. Connor Campbell performs his original song "Strangers." Singer Sonwriter Connor Campbell performs. Another speaker, Sandra Fioramonti-Sabene, told the crowd how she uses her past as inspiration to move forward and motivate others with her work. 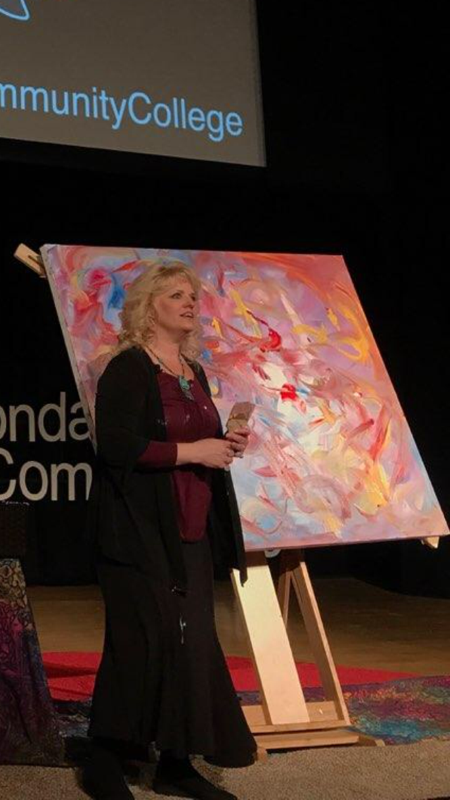 The artist and motivational speaker presented what she calls “the art of letting go.” She hoped to show the audience how to enjoy the process of creation rather than focusing on hopes for the outcome. Fioramonti-Sabene performed meditative painting, a form of painting in which artists emphasize the process rather than the result. She explained that her goal was to show others how letting go can actually serve as motivation. Sandra Fioramonti-Sabene spoke about Art Therapy. She owns Liverpool Art Center. Ultimately, she wants people to live in the moment and stop focusing so much on the final outcome. Co-founders of Worldwide Musicians United, speakers Daniel DeMento and Julian Garcia Reig, touched on a similar idea with DeMento urging the audience to act now. The two met online and virtually created their music collective before ever meeting in person. In their talk, they praised the power the internet has to bring people from around the world together and help us accomplish our dreams now instead of waiting. “If we’re going to stay engaged over time, we need to find the projects that deeply move and inspire us, because these are the ones were going to want to work on. A great side effect is that we start to worry less and less about what other people think we should be doing. It’s a way to build our dreams." Their talks and others from the event will be available on the TED website starting next month.